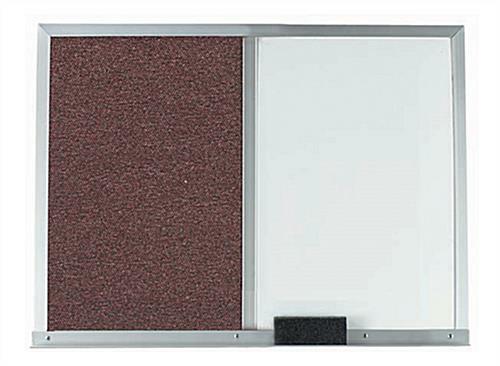 This Cork Board Combination White Board Fits Any Wall! This Cork Board Optimizes Meeting Time! Shop Online for Notice Boards at CorkBoards2Go.com! 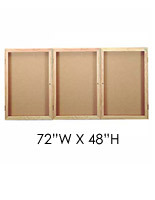 Common Size: 48" x 36"
Cork boards need to be extremely pragmatical and flexible. This combo board is ideal, total dimensions are 48" wide x 36" high...half is a 24" x 36" write on markerboard and the other half is a 24" x 36" brown fabric cork board. This furnishes the versatility of being able to post printed memos and subject matter while readily handwriting a message or teaching a lesson. Includes storage tray to handily hold your markers and eraser. This is the second grandest size and will be ideal with one in each room you have. The satin anodized aluminum frame furnishes a longstanding border and help this good match the decor of these room or office. 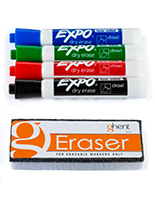 We supply you a set of markers and eraser and likewise mounting hardware so you can hang from your wall.